FLASH: Chuck Kacsur smashes club record in the 800m run with a sub-1:56 effort. BIG CITY: "I spent a lot of the race in lane 2. Great competition and good weather. 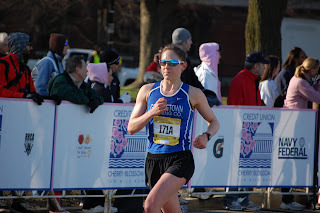 Deciding if I should race at Maryland on Thursday"
If anyone who looks at the blog wants to serve fellow runners via a running retail store, let me know ASAP. I am looking for a mature professional salesperson who wants to wine and dine customers and adhere to their needs. Most of the job entails working with folks to ensure they get the proper fitting shoes, are provided insightful council on their running and subsequent advice on apparel and accessories and their value to the sport of running and endurance sports. We pay decent and provide very good employee discounts on products. 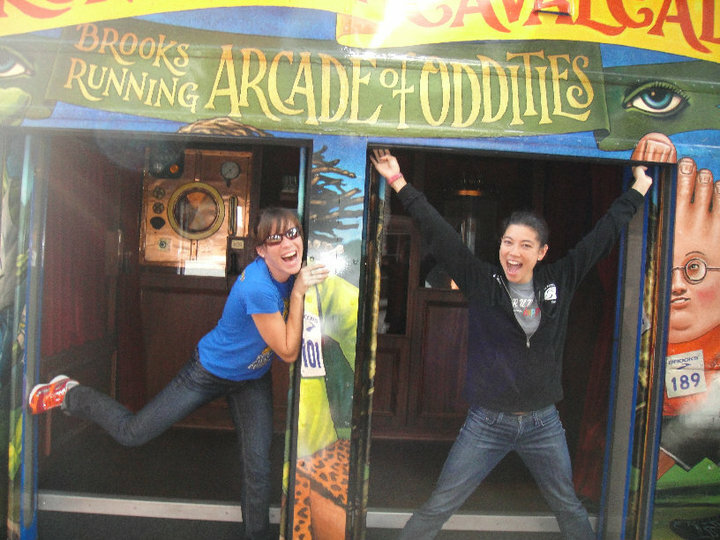 This a fun job and allows you to be creative, pleasant and service oriented. Locale is the Chevy Chase store. Need some help on Saturdays and Sundays and weekday mornings. Note that this week and next week we are at American due to conflicts at BCC. 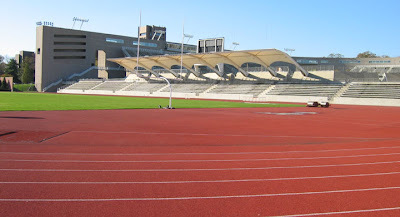 Let’s try to get started as close to 7:00 as possible on Wednesday, as there are no lights at AU and we will get kicked off the track by the campus police when it gets dark. On the men’s side, we’re going to have a very small A group presence again this week. The workout for the B group will be 8 x 1200 with a 400 jog. Target paces are 2 @ 76s, 2 @ 75s,, 2 @ 74s, 2 @ 73s. If anyone wants to make adjustments based on imminent races, let me know. 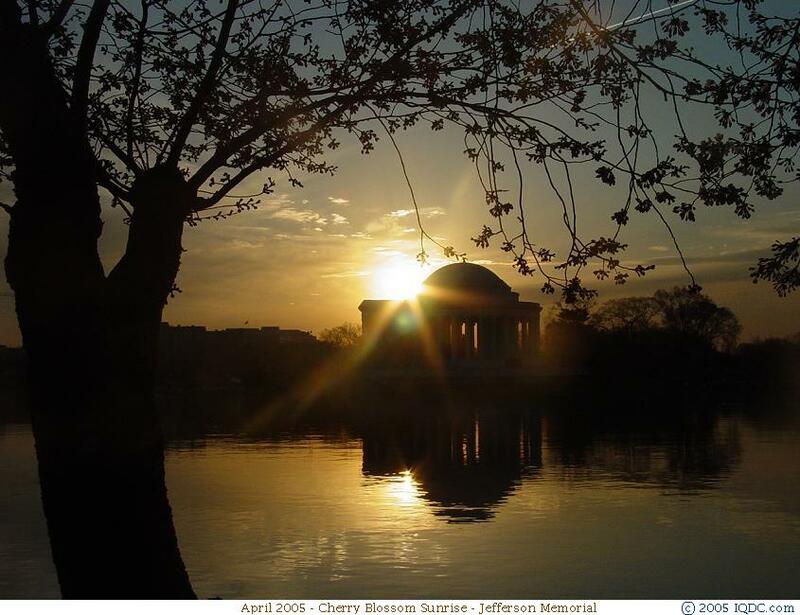 Also, Dickson will be doing his 3 mile tempo at marathon goal pace prior to his imminent triumph in Gettysburg, and if anyone wants to join him, I’m sure he’d enjoy the company. For the women, we’ll do 4 x 2k with a 3 minute rest. We’ll shoot for going through the 1600 in 6:00, 5:55, 5:50, 5:45. 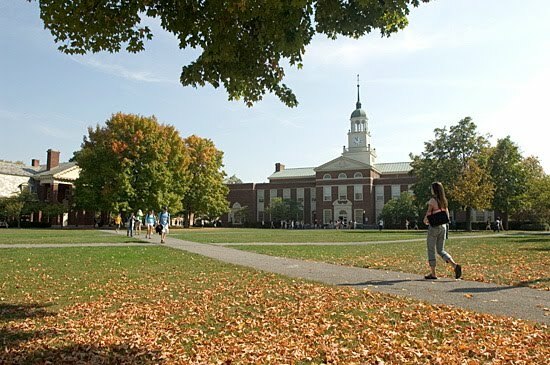 I’ll see you at AU on Wednesday. POST RACE ANALYSIS FROM COACH JERRY: What an amazing run by Sam on Friday at Princeton! 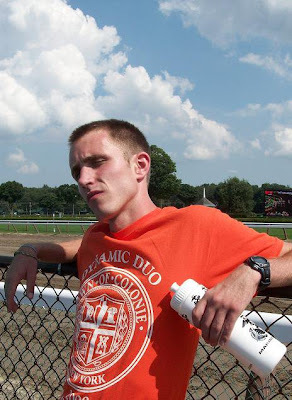 To put Sam’s accomplishment into context, consider that while Sam ran 14:15.2, our own Dave Nightingale won in 13:58.6, running what track-side observers unanimously agreed was an excellent race. 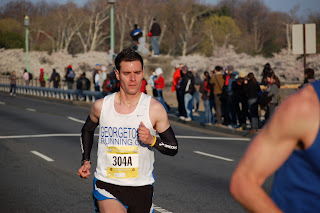 Dave has qualified for the Olympic Trials in the marathon and ran 48:39 at Cherry Blossom. Sam was less than 17 seconds behind Dave on Friday. 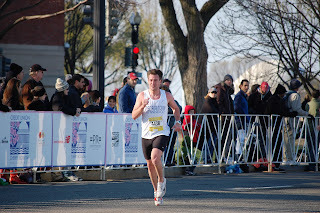 And consider that on Friday Sam was less than 7 seconds behind Lucas Meyer, who ran 48:26 at Cherry Blossom and was the first American. Sam went head to head with an elite field on Friday and proved that he belonged out there with them. Major breakthroughs like that do not happen by accident, and Sam has worked extremely hard to put himself in a position to run with the big boys. 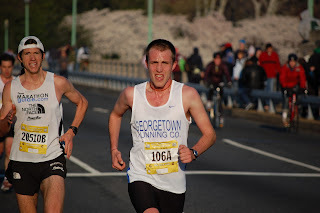 And Sam is just getting started on the Luff triple crown, as he is shooting for a big 10k PR on Thursday at the Penn Relays and will then take his shot at a fast half marathon at Grandmas in June. I'm looking forward to more great performances from him, starting this week! On a personal level, it was a thrill for me to be there to see Sam's race. Over my 20 plus years in coaching I've given many, many pep talks after races to disappointed runners and it is a rare pleasure indeed to have the opportunity to greet a runner after a race who has exceeded his own expectations. The look of pride and accomplishment on Sam’s face after the race is precisely what motivates me to find the time to continue coaching despite all of my other personal and professional obligations. One final observation is that it has become clear to me in the last several weeks that at our level it is critical to choose races carefully. 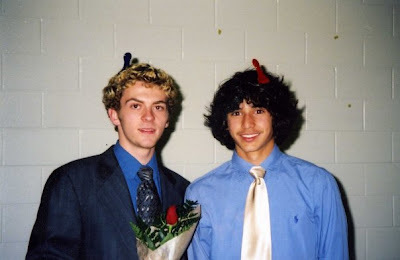 It is no accident that Ryan's 3k club record and Sam's 5k club record occurred at very competitive meets, and that we had a slew of PRs at Pikes Peak, an extremely fast race. Running against good competition is no guarantee of success, but it is important to put yourself in a position to succeed by running races where there will be others out there to push you out of your comfort zone. I'm enjoying this string of PRs too much to not make sure that we keep them coming, so let's all make the sacrifices necessary to get into races where the competition is there to allow you to run well. PRINCETON, NJ -- Running in the fastest of 5 heats in cool conditions, Sam Luff crushed the GRC record in the 5k at the Larry Ellis Invite with a time of 14:15.2 last night. Luff was attempting to run 4:35 pace and finish just south of 14:20. This is a 20-second PR for Luff and it smashes the previous 5,000m track club record of 14:46 by 26 seconds. REPORT: Luff hit 3200m in 9:08. MORE: North Bethesda Distance Project projected Luff at 14:17 as late as Thursday. ALEXANDER: "Pace was slow (for Wiggy), like 9:26. 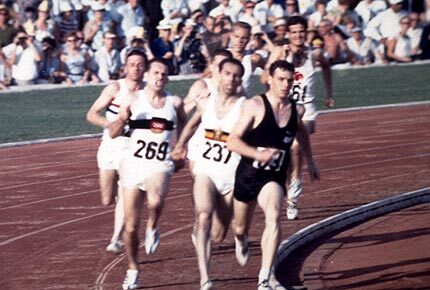 (He) made a big move to open up the pack but the move hurt him bad and he struggled last mile. He fought very very hard but was not fully recovered from Pike's Peek. 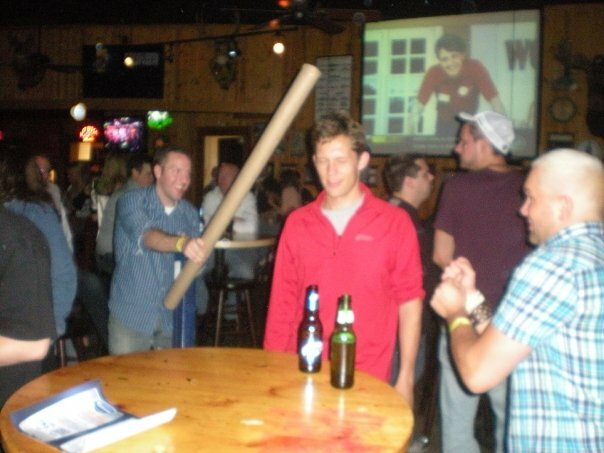 The effort was there and tactics were right on. I'll call the night a huge success though--Luff was brilliant!" Hanson - 3:54.7I (eq 4:12 mile)...just .4 seconds off GRC record! ALEXANDER: "60.8 at 4, very slow second lap, 63 on 3rd and strong finish, 45.3 appx on last 3. He caused race to be called back with an NHL caliber check on a guy who cut him off. He said race felt too easy. He'll be ready for big PR at Penn." 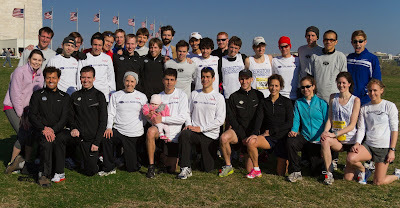 ROCKVILLE, Md -- The Georgetown Running Company had a fantastic showing this morning at the highly competitive Pike's Peek 10k on Rockville Pike. A strong tail wind and near-perfect racing conditions made this year's race the fastest in recent memory. 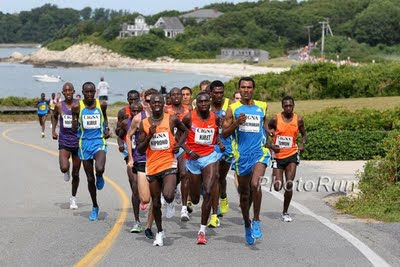 The course record was smashed when Chapel Hill area Kenyan Julius Kogo ran 28:06. "Twinbrook" Joey Wiegner teared through mile 1 in 4:38 and never looked back. Although attempting to run 30:30, Wiegner, who hit 5k in 15:11, still set a personal best with a time of 30:40. The Beastman, Dirk de Heer (31:01), wasn't far behind his teammate after hitting the halfway mark in 15:16. Dave Burnham, who is getting faster by the week, was just a few seconds back in 31:13. Dickson Mercer broke through a series of frustrating weeks and notched personal best of 31:38. 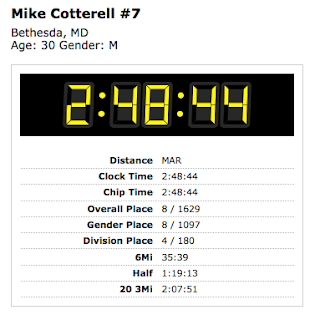 The Chicken Tender Runner bested his pre-race goal of 32:20 running alongside Dave Wertz. Patrick Murphy also had his best race in awhile after recording a time of 32:26. Frank bests his 10k my one minute. Masters runner Jordan Snyder dipped under the 34:00 mark with a 33:52. He finished 4th in 40+. Michelle Miller led the women with a time of 35:40.Susan Hendrick was next up at 37:07, just a ahead of teammate Beth Young in 37:30. 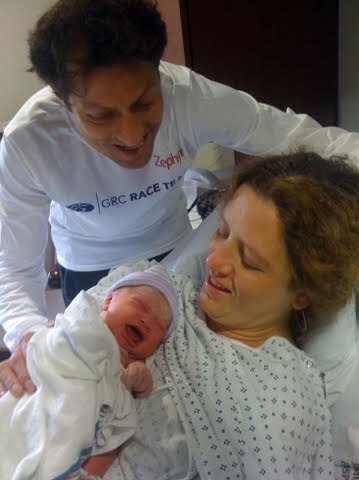 Emily Dusen has returned from maternity leave and mustered up 6:09s for a 38:11. MORE: Wilson Komen, now running for Reebok, ran 30:18 just ahead of marathon man Michale Wardian (who PR'd today by 15+ seconds). Benedict Sloane ran an extremely impressive 31:24 - perhaps the race of his life. Ban runs 16:00 at B.A.A. 5k in nasty conditions. "Perfect" conditions, including a 20mph tailwind, predicted for Boston tomorrow. Trailer for the forthcoming documentary of this year's epic race. "For optimal viewing, watch the the video on the Vimeo site, in HD"
Hanson battles to 6th in the 3K at UMD Invite, finishing in 8:33.7. 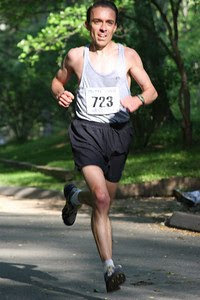 From Coach Jerry: "He ran a great race tactically... unafraid to go for the win against the Pacers A team. It was a gutsy race." Ban runs 15:48 for the 5K at GMU. Went out too fast, and finished six seconds slower than in Richmond two weeks ago. 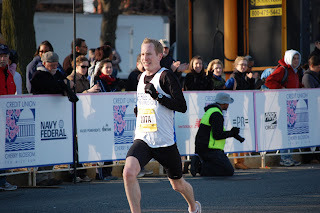 Mike beats the heat in the St Louis Marathon, finishing 8th in 2:48:44. "It was a great day for GRC on Sunday. Like a kid on Christmas morning who gets 20 new toys all at once, it's impossible for me to fully appreciate each of the excellent performances that I saw yesterday, so please forgive any omissions in my analysis. Starting with the women, we had 3 huge PRs. 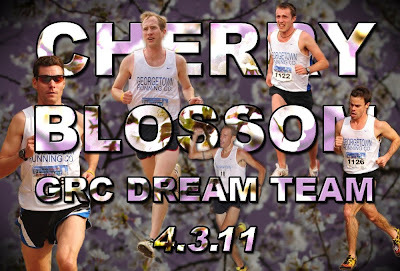 Michelle looked spectacular out there--a top 10 finish at Cherry Blossom is truly a monumental accomplishment! And Lindsey and Beth also ran extremely well and there's every reason to expect further breakthroughs this spring. For the men, there were so many great performances it's hard to know where to start. Karl is clearly back in shape, and based on what he did yesterday and the rapid improvement he's making, I am very optimistic about his chances to qualify for the trials at Grandmas. Sam and Jerry both had big breakthroughs yesterday that bode well for great seasons. Sam is looking at track PRs in the 5k and 10k, and Jerry is going to ready to do something special at the USATF 25k champs. Wiggy did not have his best day, but considering the problems he's had the last few weeks, it was an excellent performance, with much faster times to come soon. 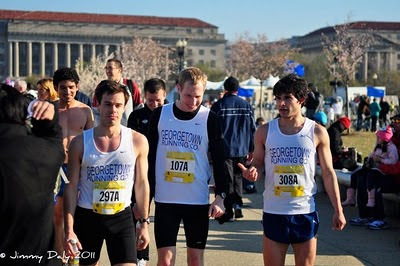 Dirk said to me after the race that he felt pretty good about his race considering he's only running 25 miles a week. For most runners, 51:40 is a career performance, so I'm inclined to agree that it was pretty darn impressive based on what Dirk has been doing. Matias and Andy also ran extremely well for guys who have not focused their training on running. Perhaps everyone should spend their time on the bike and in the pool--it sure seems like it's working for those guys! I was very excited about Dave Burnham's race--Dave is working his way back to race fitness, and his progress in the last few months has been fantastic. I'm also extremely excited about Paul's run--for a guy who has not done any quality work, and who until a few weeks ago he had not run on dry land for a couple of months, it was an amazing performance. I was also very pleased with Dave Wertz's run. A year ago Dave would have been thrilled to run 5 miles at that pace. And finally I was quite impressed with Jordan's performance. Considering that a few weeks ago he was ready to get surgery for a nagging injury, that was an outstanding run. Well done to all! We're back at BCC this week (and for the next 2 weeks after this). We can roll at 7:15 as normal. 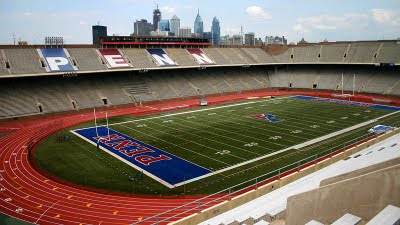 Note that there is a track meet in the afternoon, so it's possible that we may have to delay the start a bit until the track is clear, but I expect we'll be fine to start on time. As for the workout, we'll do a 6-5-4-3-2-1 ladder, fairly relaxed, as everyone needs to go a little light to recover from the race. The A group will shoot for 75s on the 6, 74s on the 5, 73s on the 4, 72s on the 3, 70s on the 2, and 68 on the 1. The B group will shoot for 79s on the 6, 78s on the 5, 77s on the 4, 76s on the 3, 74s on the 2, and 72 on the 1. I'll see everyone at BCC on Wednesday." 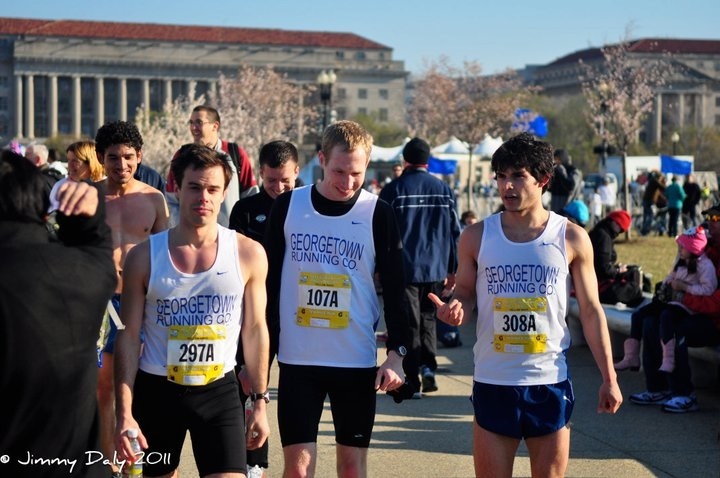 The Georgetown Running Company Race Team had arguably its finest performance ever this morning at the Cherry Blossom 10 Miler in downtown Washington DC. With almost ideal racing conditions, the race team, led by Karl Dusen, left the starting line strong. Dusen hit mile 1 in a comfortable 4:56 just behind Americans Luke Meyer and Dave Nightingale and was followed closely by PACERS nemesis Bert Rodriguez and GRCers Jerry Greenlaw, Sam Luff and Joe Wiegner. 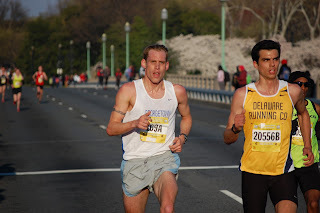 Rodriguez and Dusen were running together just after mile two just at or under 5:00 minutes per mile. By mile 3, Greenlaw and omnipresent distance guru Mike Wardian led Luff in a chase pack after what appeared to be a struggling Dusen. Dirk de Heer and Dave Burnham were stride for stride some meters back. In the race for top American, Meyer, at mile 5, continued to lead Nightingale by a healthy margin. Meanwhile, Rodriguez seemed to surge after hitting the halfway mark and Dusen continued to struggle. Wiegner had fallen off the pace some and now ran stride for stride with de Heer. Burnham was just a few strides back. At mile 6, Greenlaw, with a determined look in his eye and his small frame leaning into a Hains Point wind, led Luff and Wardian. Luff looked comfortable and strong. It was clear he would soon make a push. Dusen still trailed Rodriguez, considerably, heading out towards the tip of Hains Point. At mile 8.75, the tide turned. Through a tunnel of pink cherry blossoms in full bloom, Dusen emerged ahead of a "worked" Rodriguez. Bert's form had now deteriorated and Dusen looked like he does going into the last repetition of a Wednesday night workout – tough as nails and fired up. Luff by now was GRC's number two man heading into the last mile. Outlaw looked tired, but not beat. In five minutes, it wouldn’t matter anyway..they’d be finished. 18. Sam Luff 50:45 PR! 19. Jerry Greenlaw 50:55 PR! 38. Matias Palavecino 53:45 PR! 40. Andy Sovonick 54:22 PR! 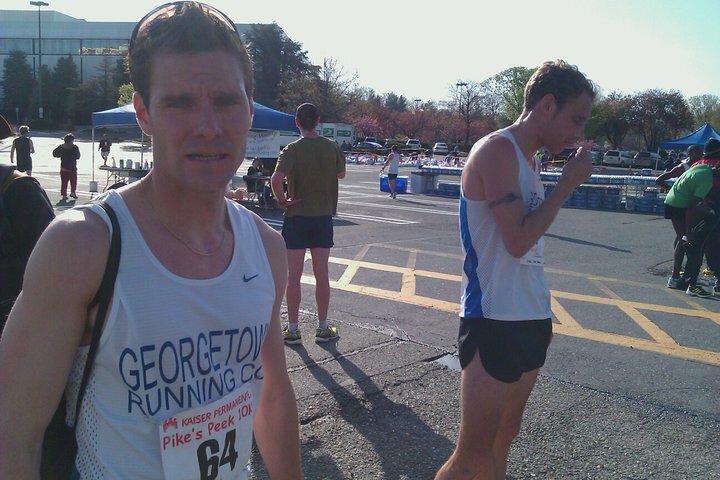 9:00am: Easy pre-race run from the Georgetown Store. Be sure to stop by the store for this shake out run as we'll be distributing our NEW warm up long sleeve t-shirts! If you still need a GRC singlet, this is the time to get one. Make sure you see Jake for both. 10:30am-ish: Packet Pick Up. Maybe after grabbing a bite to eat, some of us will carpool/metro over to the National Building Museum for packet pickup. This tends to be very crowded, so the organizers have changed the set up slightly. Make sure you have a copy of your confirmation email (including your number) either on paper or on your smartphone, otherwise you'll be stuck in packet-pickup-purgatory. There will be NO number look-up boards. If you can't make it on your own before 5:15pm on Saturday, there is limited packet pick up at the race Sunday morning, or you can write a note and give your confirmation email to someone else so they can pick up your number. 5:00am: Metro Opens Doors. Parking is going to be very limited downtown, so either plan to get a ride, metro, or bike to the race. There will be a bike valet at the start area. If you plan to metro to the race, service starts as early as 5am. 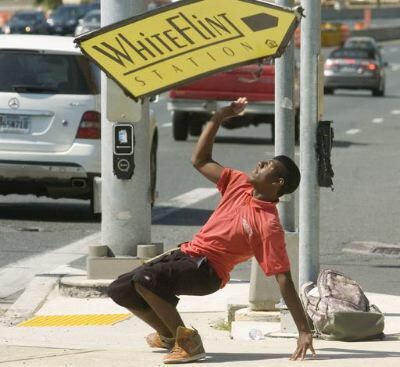 The nearest stop to the race start is the Smithsonian station on the Blue/Orange Lines. If you don't want to transfer, Archives is the closest station on the Green/Yellow Lines and Metro Center is the closest on the Red Line. 6:30am: Warm-up. 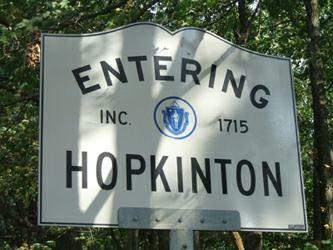 Plan to gather at the meet-up location on the map below at 6:30 for an optional team warm-up. 7:40am: Race Start. Good luck! Run fast, and look good while doing it. The full GRC press corps will be on hand to document the race, including a film crew at miles 0.5, 5, and 10 orchestrated by Towpath Productions, and several photographers throughout the course. Contact Towpath directly if you would like to help. 8:29-8:45am: GRC runners finish. Group up at the finish. DO NOT WANDER OFF. 8:50am: GRC Team Photo. We need a team photo that includes all of our new faces for our new website. 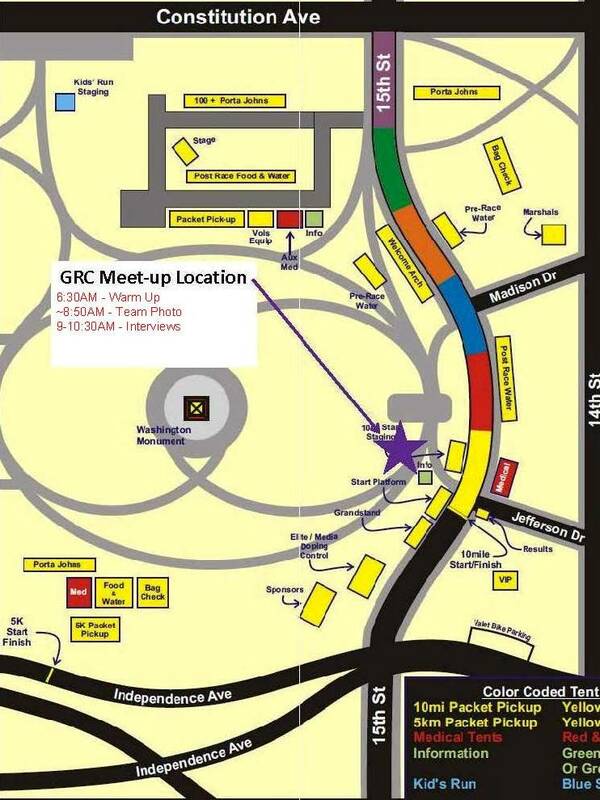 Keep your GRC singlet or warm-up on and meet at the same location as for the warm-up (see map below). Besides racing fast, this is the only "mandatory" thing we need everyone to do. The faster everyone cooperates, the sooner this will be over. 9:00am-10:30am Cool down/Interviews: You're free to do whatever you need to do post-race... cool down, see loved ones, etc. Try to generally stick around the meet-up location as Towpath Productions will be conducting interviews. 11:00am Post-race festivities: Klim will be leading a contingent to Elephant and Castle at 12th and Pennsylvania Ave. for post-race lunch and drinks. Any general race-related questions can probably be answered in this information packet. If you have any team-specific questions, share them in the comments. WASHINGTON, DC -- The Georgetown Running Company Race Team will send its largest running force ever to do battle at the Cherry Blossom 10 Miler on Sunday. GRC's finest will be among the top Americans competing for an all-expense paid trip to the Peachtree Road Race on July 4 in Atlanta. Race officials have billed Lucas Meyer as the top American. 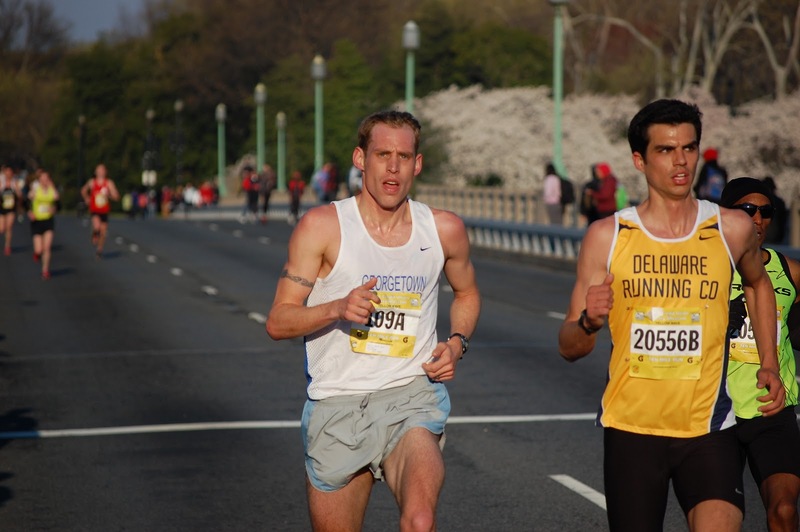 Karl Dusen, fresh off a 24:03 5-miler, leads a troupe of hard charging racers vying for the $1000 prize purse offered in the Washington Metro Area Elite Team competition. Jerry Greenlaw, Sam Luff, Joe Wiegner and Dirk de Heer complete the "Dream Team", while another 15 athletes will be racing for personal glory, personal bests and honor. "I expect a huge race from Karl Dusen. Karl has been running fantastic workouts and very high mileage", notes Coach Jerry Alexander. 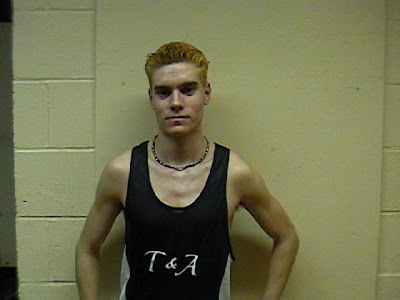 "I also expect excellent performances from two of our young stars, Jerry (Outlaw) Greenlaw and Sam Luff. Jerry was a little disappointed in his perforamance at the USATF 15k Championships, but he is focused and ready for a major breakthrough on Sunday. 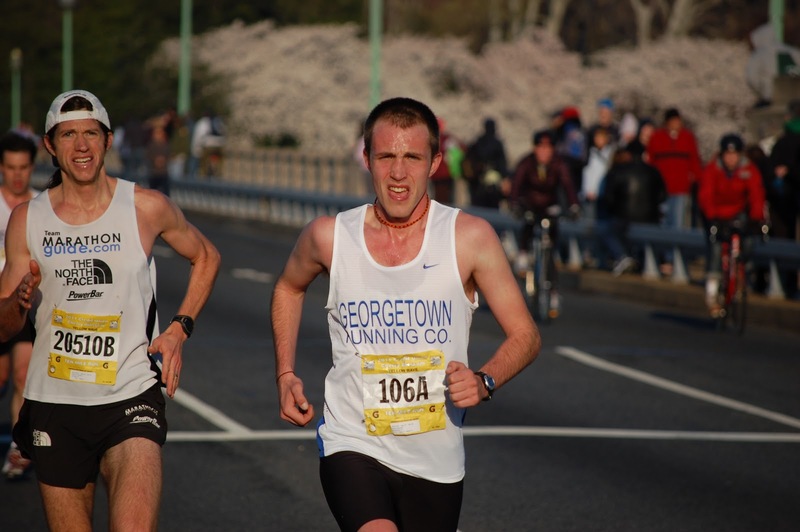 Sam is race sharp after winning the Shamrock 5k in Baltimore and running strong at Van Metre and is ready to show what he can do at the longer distances." "Joe Wiegner missed some training due to illness but he has looked strong in practice for the last couple of weeks while Dirk is improving rapidly after taking time off from running over the winter to focus on his swimming and biking. His 15:12 5k at Shamrock demonstrates that he is ready to compete." Dave Burnham appears to be in the best shape since donning spikes at Dartmouth while Andy Sovonick comes into the race fresh off a 5k PR in Baltimore. We're also looking for strong performances from our women's squad. 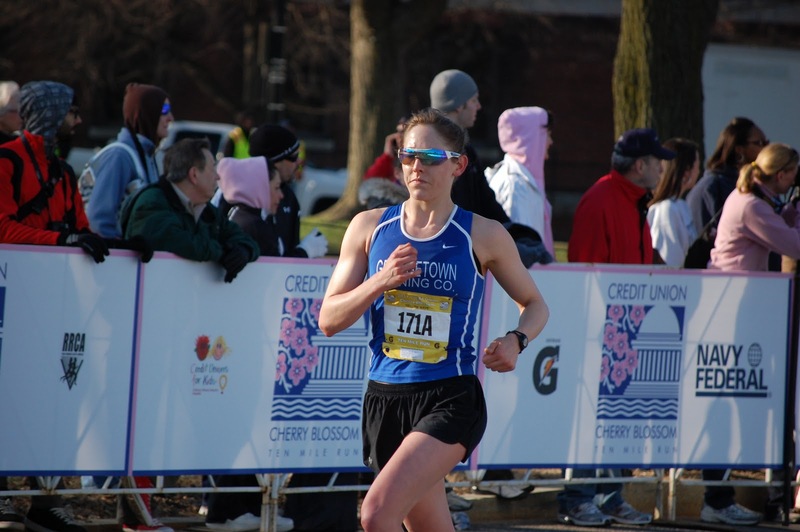 Alexander adds, "New GRC member Michelle Miller is in excellent shape and has a great shot to break 60 minutes, and Beth Young is also ready for a big PR, despite training through the race as she prepares for the Green Bay Marathon on May 15." GRC Media will be providing extensive coverage of the event and results from the race will be "flashed" on this blog as soon as able. GRC Expats Patrick Reaves and Billy Askey will also be racing.